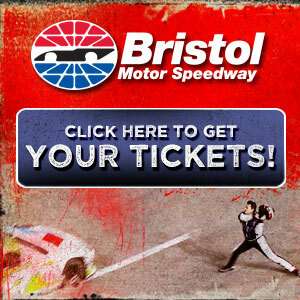 Kyle Busch and Joe Gibbs: What's next? Hey, a Truck ride for Ron? Tony vs Carl, Round 1 of NASCAR's 3-Round Title fight...& for everyone else it's Daytona 500 on the mind -- and the rules? Junior holds court, and you'd better believe NASCAR is listening: What to do about Daytona and Talladega? No temper tantrums, no angry drivers, no bruised feelings, and not really all that many donuts on doors. No, Sunday's 350 didn't follow expectations. However it did have a feisty finish....and Kansas farmboy Clint Bowyer must have spent some good time on those Midwestern dirt roads. 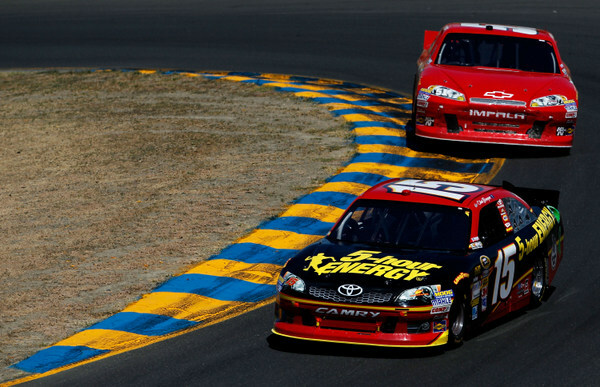 How else to explain Bowyer's amazing stretch run holding off first Kurt Busch, last year's winner here, and then Tony Stewart, one of the sport's top road racers, to win Sunday's Save Mart 350. The race had been billed by drivers as one of the roughest on the tour this season, but it didn't live up to the big talk. Very early in the three-hour race it was clear that tires had little grip, drivers went quickly to tire-management scenarios, doing their best to conserve tires. The tire -- used at Watkins Glen and Martinsville -- was designed to be fast early in a run and then fall off in speed; but all afternoon drivers complained about poor handling and no grip. And then down the stretch it wasn't clear how many drivers might run out of gas, so fuel mileage became a factor. In fact Bowyer ran out of gas while doing a celebratory burnout and had to walk to victory lane. But that certainly didn't diminish Bowyer's enthusiasm about the victory, the sixth tour win of his career but his first since joining Michael Waltrip this season after so many years with Richard Childress. "To switch teams like I did was a huge risk for me... and a chance to prove myself," Bowyer said. This day was also a chance for Busch to prove himself....in another way: he's been the bad boy of NASCAR lately, in a bunch of trouble, and having more than his share of angry run-ins with journalists. However this day, after a brilliant battle between Busch and Bowyer, it was a humble and emotionally drained Busch meeting the press...in a remarkable encounter that ended with many in the media applauding Busch as he left. While most of the race was lackluster, as most races have been this season, curiously, the final 20 laps were tense. Bowyer was in command down the stretch, but Kurt Busch -- who only two weeks ago had to serve a one-race NASCAR suspension -- was all over him, pressuring hard in nearly every corner. However with just 15 miles to go Busch tagged a tire barrier and damaged his car. That left him battling Stewart for second, and Stewart got by him for the sport. That battle behind him was just enough to give Bowyer breathing room. The race went overtime after Kyle Busch tagged Paul Menard in turn 11 and brought out the caution with four laps to go in the scheduled 110-lapper. At that point Bowyer himself was drained from a very strenuous dual with Busch, who was bumper to bumper in nearly every corner. And Bowyer had just been able to pull away to a comfortable five-length lead when that yellow came out. The yellow didn't not please him a bit. 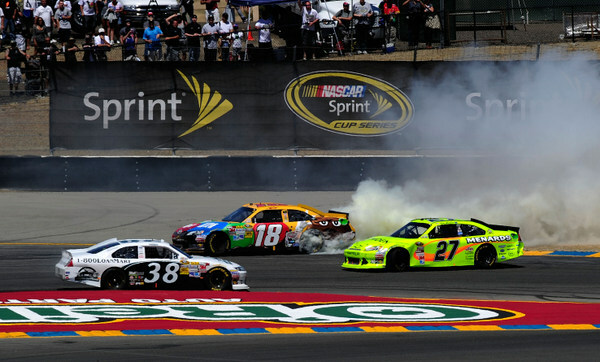 And Busch, though he had damaged his suspension, said he still felt he had a shot at Bowyer on the final restart. However it was not to be. Bowyer has never been considered one of the sport's great road racer, but he led the most laps by far, and in the clutch he was amazingly smooth and cool. 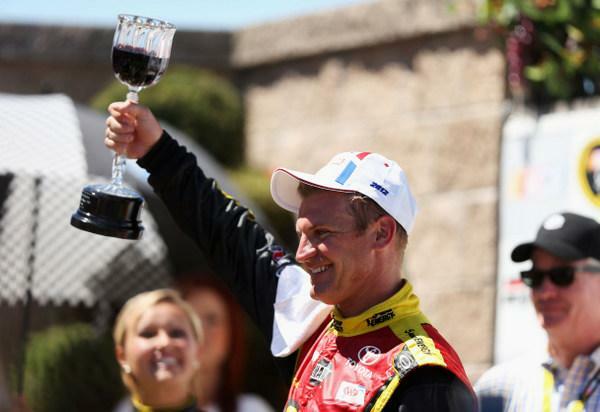 Bowyer as road course ace? "I don't think anybody had in the past," Stewart conceded. "But he had good speed all weekend, so it didn't surprise me to see him up there. "I don't think any of us are really good road course racers, but we have to do it twice a year and somebody has to win." Busch himself -- because his very career has seemed on the line in the past few weeks -- was unexpectedly emotional afterwards. I was thinking he's just a dirt-tracker from the Midwest, and there's no way he's a road racer. But today he was. "It's an amazing day when you come this close, with a small team like James Finch has, with only a third the budget of the big teams. "I'm a little choked up, because we were so close. "I was very considerate to Bowyer, who was going for his first win with a new team....and I just made that one mistake in turn 11, when I hit those tires, with about eight to go. Those tires have never been bolted down before, but they were bolted down today. "No sponsor....but it's Team Tiger's Blood -- Charlie Sheen." 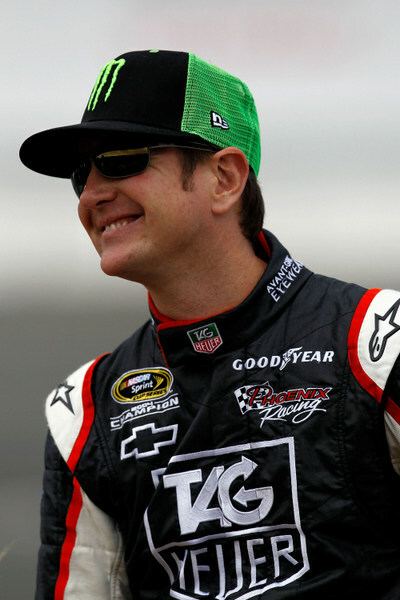 That was a reference to some calling Busch 'the Charlie Sheen of NASCAR' for his sometimes uncontrolled anger. "To be that close....and make just one mistake....that's tough," Busch said painfully. "I was very patient with Bowyer. No banzai moves here. Just respect. "He was there for the taking at the white, but I couldn't get close enough to do it." 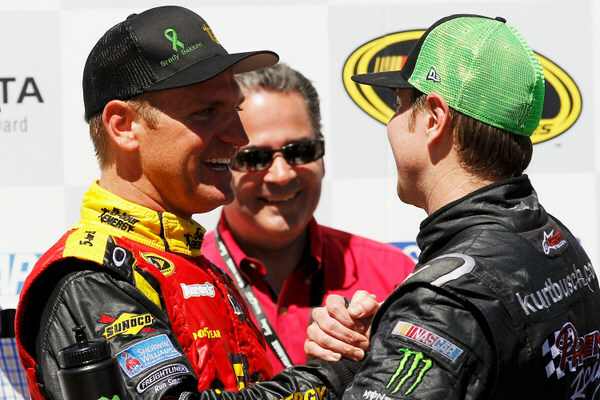 Busch's driving talents are well known and respected...and then he revealed that he'd been giving some of his road racing tips here to Jeff Gordon and Jimmie Johnson, who are sort of 'teammates,' in that Finch runs Hendrick cars and engines with Hendrick engineering support. "There was a car out there on the front row (Gordon) with my setup, and Jimmie Johnson up there too... Hendrick Motorsports is a great operation...and we may have helped them a little with the setups here," Busch said. "If I can get my head on straight here and after the race, I can keep racing every weekend for victories."